Can Apple reform the Ad-tech landscape? Siri, play "Somebody's Watching Me"
Apple is offering great opportunities to make content and experiences impactful for the members of a marketer's audience. From Augmented Reality, to Do Not Disturb While Driving, to a new home speaker, to peer-to-peer payments directly from iMessage. Apple is not really an ad-tech company, although they are a content company, and other than some small business with promoted App store listings, Apple here is offering tools directly to consumers that will make them want to stay in Apple’s ecosystem: limiting video Autoplay, and “limiting cross-site tracking”. This move hits straight at the ad tech world - many advertisers use a tracking pixel to track the display ads they serve across the internet at the impression level. Another impact will be on cross-device identification, which could be weakened by this move. One of the biggest culprits of such tracking is actually Google, so one wonders if this will impact Adwords, Google Attribution, or Doubleclick; or Facebook’s audience network. Or Amazon’s DSP business, rumored to be growing. But even so, Safari’s marketshare is 15% at best – although Mac users are no doubt an attractive potential audience if they’ve shelled out $349 for a speaker. Apple is in a unique marketing position - relying on stories instead of advertising. Events like WWDC have people TUNE IN to their product launches – how many people watched Werner Ladder’s latest product rollout? 384. Instead, Werner spends millions on sponsorships like March Madness programming. If Apple lost the tracking data on millions of dollars in digital media, would they care (according to SpyFu, Apple spends about $200K per month on paid search). And if it hurts Facebook, or Google, or Amazon – a nice bonus- over 75% of Apple devices were on iOS 10 3 months after its release. In Apple’s announcement, the reference to machine-learning (buzzword) seems to be, that in MacOS High Sierra, Apple’s Safari browser, will observe cross-device tracking patterns and determine what to block, compared with ad-blockers who rely on constantly updated but ultimately static lists. So if advertisers want to use impression-level tracking in their ad campaigns, perhaps that will hurt measurement, optimization, or yield, and this might make it harder to prove that Impressions led to the success events marketers care about. But unless Apple removes URL redirects and click-tracking, some of the data Apple is talking about probably has to stay on your machine. Adding transparency to the ad tech ecosystem should be pro-consumer – Apple’s move might create incentives to hide behind any vendor that can stay on Apple’s good side. On the other end of the double-edged sword, these tracking technologies can also be used to properly optimize for frequency, so advertisers can responsibly choose NOT to show you that ladder for the umpteenth time. Apple can’t disable everything without harming the user experience – the same goes for the kinds of responsible advertiser behavior I’d like to see more of. But consumers don’t need apple to do anything to participate in blocking adtech and martech trackers- Adblock, Crystal, Ghostery, and others have plenty to offer. Nearly 20% of US internet users block ads already, and rising [Mary Meeker charts this here]. We don’t quite know any of this for sure, since we haven’t actually seen the new Safari interact with various trackers. How will Apple know if the tag that is loaded by the winner of a programmatic ad auction is a “tracker” – or just part of the ad experience, like a dynamic ad creative unit? Maybe Apple will also offer publisher control or a promise that their ad inventory is going to reputable advertisers who won’t let that bicycle follow you around the internet (Apple’s use case) - which could potentially advantage PMP deals within premium publishers. Perhaps Apple will work with the Digital Advertising Alliance to get some industry collaboration. The desktop web is a complex place with ad tech and martech “trackers” doing many of the same things when providing functionality people like or want. In its most devious version, this is a real jab at Google, Facebook, and Amazon – who want to gather data about you- some implicit, like browsing activity or location, and some explicit, like what you browse, watch, buy or publish. In its most benign, this is just noise on the minority of browser sessions that even use Safari. It won’t be easy to estimate what harm this may represent to ad execution, tracking, and measurement, but I volunteer to test how it all works. I am leaning toward the HomePod in Black and the Macbook Pro in Space Gray. Does your organization design job titles and specifications to place emphasis on the customer? When considering the ability of different parts of your team to impact the experience of your customer, where are the points of pressure? A commercial transaction is an experience, wrapped around a promise. The value which is exchanged (monetary, utility, emotional) and the extent to which the transfer is well-balanced, affects the experience of the promise. Over time, a brand's meaning is the sum of the promises made and kept. Answer inquiries on the phone or those that come in by email? Decide on employee compensation, perks, or benefits? The people who do any of the above are not just employees; these people can make, keep, and break promises. Now think about the number of those people whose job title is coordinator, specialist, or assistant? How many of them receive instruction from managers, directors, or VPs? "Candidates should only apply if they can provide the highest level of customer service, with a smile on their face, no matter what the position throws their way." To handle the unexpected, to be sure about your motivation and commitment to customer success? It's not always easy to keep your promises - having people who take that seriously, and who know they are empowered and expected to do so, can make all the difference. Don't waste an opporuntiy to think about how your next "Assistant" will delight a customer, and maybe even lead by example. Trading Places is among my favorite holiday movies. On January 2nd, what can we learn from the film? The Rise of Digital Product Managers at Time Inc.
Digiday has a nice look at "product builders" at Time, Inc., who in their independent existence (free of the Time Warner mothership) begin with an idea and a landing page, find some early adopters, and refine their products. 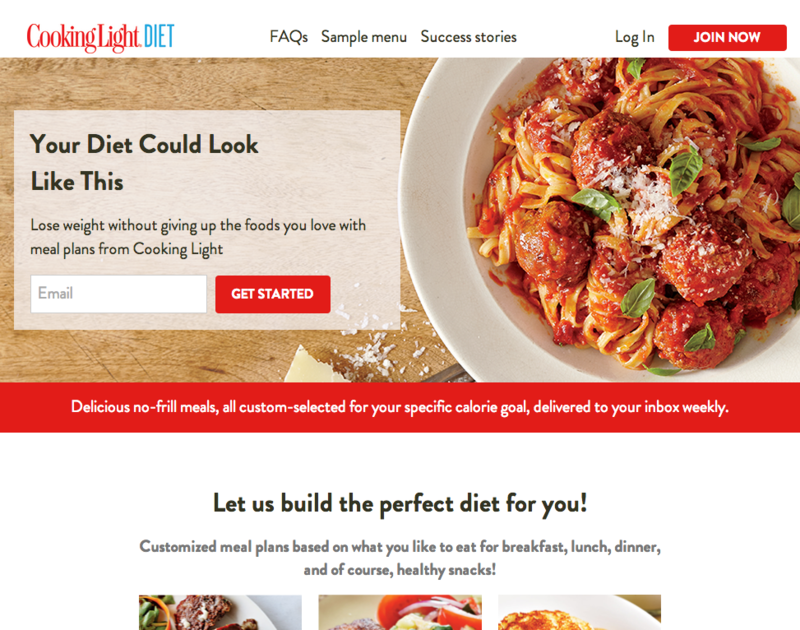 The "Cooking Light Diet" app appears to be one example. Under SVP digital Kevin Heery (it appears) that a team of 4 product managers, who work in conjunction with the editorial staff have figured out how to build interesting products - not just more pageviews. Tough Mudder has been somethign of a facscination for me ever since I began work at Competitor Group. I personally admired their approach to social marketing, and it was clear that the mud run category offers somethign much diferent from the bands-along-the-course marathon celebration. Rachel and I have been doing crossfit now for almost a year, mixing Monday-Friday workouts in with 2-3 runs per week. This worked well for preparing us for the overall enducrance challenge. The fact that we had completed the Rock 'n' Roll San Jose 1/2 Marathon a few weeks prior seemed to confirm we were up to the challenge. Our course at Vail Lake was billed at 10+ miles, so while there was less running, I definitely felt more exhausted by the experience than running 13 miles - this event challenges everyone in different ways. TM is a brutal athletic event with lots of people and plenty that is frightening, intimidating, and yet very memorable. Have you come a long way? I promise to remind myself how far I've come. Clockwise from upper left: me ca. 2006, my wedding in 2011, me in 2012. I lost 75lbs and have kept it off for 6 years. "Now, i'm going to ask, Are you good? And you just say back, F*ck yeah!" And we all respond, "F*ck Yeah!" 150 strangers fill the stadium with our unified voice. We are ready. I got up at 5:45am, to go to a workout I'll never forget at a place I have never been. It was kind of like crossfit meets fight club. Taking up the charge to avoid gym memberships and motivate peers, the November Project seems well-suited to Boston's cold winters. 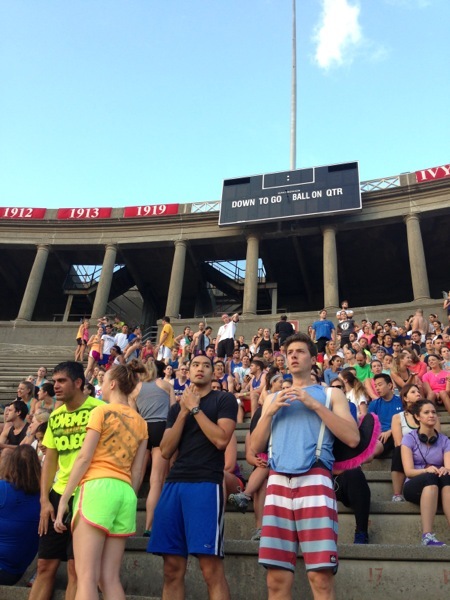 On a temperate Wednesday, I joined the Harvard Stadium workout and it was both exhilarating and utterly abusive. A key point, we are encouraged to hug the person next to us, even better if it's a stranger, and say, "Thank you for being here" I imagine Jack Shepherd and Desmond having the same conversation on LOST. If it was just two people in the November pre-dawn, can you imagine that gratitude that your buddy wasn't a no-show? If you have ever been the person who showed up, you know what I mean. And that gratitude is displayed at scale: we give thanks for the community. I hug a fresh-faced 20year old. Exhilarating- what a great community. A lot of brands try to be everything to everyone, and it takes true courage to say, "we are from the midwest and we wanted to create a community where you can make actual eye contact and have physical contact with other people. If you aren't willing to hug a stranger this morning, this might not be for you." A Full Tour is the 37 sections of the horseshoe-shaped stadium, for a total of 1,147 steps. Newbies start separately and do their workout beginning in the middle and working out from the ends. Run up, walk down, repeat. Half take the sunny side, half take the shady side. I decide to listen to their boom box easily filling the stadium with rock and high energy. I bound up the first 20 or so steps, and then my legs start to scream. I slow down to step ups, make it to the top and pause. What have I done? There are people of every fitness level. Some determined walkers, and equally persistent Atlassians who are running up the steep grade faster than I run downhill. As a Cornell alumnus taking his first visit to the Harvard campus, it is as though I must climb a step for every time I called the Crimson's goalie a Sieve at Lynah Rink. It is all my fault. I take my punishment in about 35 minutes. I'm determined to do so, grateful as I reach the top step and terrified of the next section. My legs stop working. As I walk back along the path under the uppermost bleachers I see small groups doing sit-ups and other core work. I try to run and can barely trot. I make it back to Section 19 for the group photo. I meet a blogger for the Boston.com and introduce myself to Bojan. He's intense, fit and positive. His energy is infectious. I learn that he did his workout at 5:30!!!! I stand still and my legs are shaking. What a morning. As a marketer, it was wonderful to see community building for its own sake. The level of ritual helps inculcate shared values and aspirations; simple enough to grasp and eventually you know you belong. I went on a nice little bike ride this weekend. It was memorable, because it was my first with a road bike. You know, the ones with the thin tires, and the potentiaal to cost many thousands? I rented a Felt Z85, and was pretty happy with it. I took my iPhone along for the ride. I mapped my ride with the MapMyRide iPhone app. After the ride, something crazy happened - I became a marketing opportunity. Hey, I just wanted to map my bike run! A women's antiperspirant had other ideas! Interesting- why in the lord's name would I tweet their hastag? I'm dripping with sweat! My legs are shaking! I am a man, BTW, and I have never heard of your product! As an athlete, I would never have wanted to see these ads. What could they be offering? However, being in marketing, I am accustomed to trying to find out. As my wife set about cleaning her bike, I lingered on the driveway, still dripping in sweat from an agonizing final climb. I tapped the Gilette ad. Interesting. I signed up for a half marathon Training program...we'll see how they take it from there. Nice setting of my expectations on when the plan will arrive. As an athlete, I can't think of anything I wanted less than those ads. The targeting for the first ad was hopelessly off, the second execution mystified me because I had to interact with what looked like an ad in order to egt what I want: content. The utility and content of MMF is what keeps people engaged - but what happens when all you see is ads? When monetizing the "point of sweat" - content goes further than interruption. Testing out Nitrogram to see how this all works. In a 24 hour period, Facebook touts the effectiveness of Sponsored Stories while simultaneously agreeing in a court settlement allow consumers to opt-out. Oops. Facebook and other identity and behavior networks have created new behaviors - and these behaviors have had no trouble attracting the attention of consumers. The new behaviors have been so empowering of consumers, that as they adopt new behaviros, they have learned to tune out advertising even more effectively. Consumers have even learned to kill ads, concepts, and brand strategies they dislike en masse. Debra Aho Williamson, principal analyst at eMarketer in Seattle, noted that when the firm published its most recent forecast for digital advertising back in February, it projected that Facebook revenue would probably double again this year to $6 billion, a number she said is likely now out of reach. So it's not just about your 2 Million app downloads that net you some nice venture funding for "traction" in the marketplace. Make sure you're paying attention to how your users behave, as well as how their behavior change when you add "monetization" strategies. Watch Facebook's Mobile ad product introductions carefully. If the users hate the products, and find them annoying, intrusive, or unstable, that's bad for the Facebook ecosystem and engenders the kind of hatred consumers have for companies like AT&T, in which they stay with the company but hate it because they cannot easily leave. Conversely, if the consumer ignores the ads, and skps right through them, that's bad for advertisers, who need at least some user attention to get value out of the ads. The holy grail for facebook is helping to identify the ads in the middle: the ads so content-like that consumers will see them as a net benefit. This is small thinking strategy for Facebook, at best. Which are the two or three brands whose social engagement strategies you like as much as you do their products? Those are the ads that will be premium inventory in your newsfeed. The social experiences that consuemrs want, which are so attractive consumers will seek them out for their value, are the name of the game for Facebook, because these experiences will have to rent access to Facebook's identity network. And that is where the money will be. 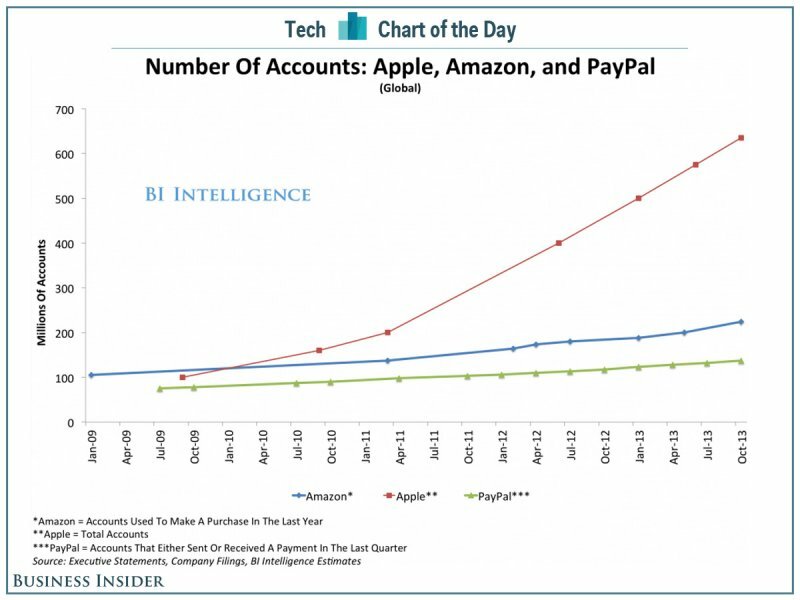 Is this BI/comScore chart bad for Facebook, or is this what we would expect? BusinessInsider says the time spent is shiftting to other social networks. I am not convinced. Look at the Facebook developer site: Build Facebook for Websites. Build For Mobile. Build Apps on Facebook. These are strategically important initiatives, all taking the Facebook platform and making the digital world more social, but also taking time and attention off of “Facebook”. From Facebook's Developer Homepage: this is what Facebook is betting on, and consumers are flocking to it. I can't prove it with the data above, but if you're only looking at minutes on the site, that's what you'd see. Behavior Networks like Pinterest are easy to start because the Facebook Identity layer is there for support - if Facebook were Microsoft it would probably have shut off Pinterest's access to the open graph; Facebook is a very different kind of company. Could your ISP track your Roaming via CableWiFi? The downside of the CableWifi roaming partneship is clearly about privacy. TheNextWeb reports that five major ISPs team up for massive Wi-Fi sharing effort across the US. Imagine the ad targeting possibilities – with a single sign on as you roam the country, your ISP/MSO record is now going to follow you around he country. Now with a slick landing page over wifi, or a flag on your addressable cable box, your surfing and travcel habits are now even more interesting fodder for multi-screen ad targeting. It would be fascinating to know whether the CableWifi folks will be partnering with an offline/online cookie solution. Reminder: free wifi is hardly EVER free. Spent 5 hours at the free event today; I felt pretty happy about getting a Spotted Pig burger instead of waiting 4 hours for a table, but the 200 people in line for Luke's Lobster was incomprehensible. What really bothered me, though, was the atrocious AT&T and Verizon service.